Cheap, great shower and great kitchen. They do laundry as well so for a quick stay is a great choice. Bed could be better though. bathrooms are not clean enough because there were urinal smell. I don't think bathrooms are enough for all guests during 8am to 9am. Smoking area was not clear so I smelt smoking even in the kitchen. However, bedroom is cozy enough even none of air-conditioner. 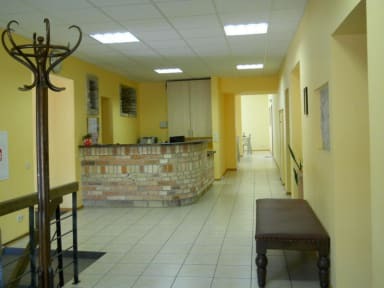 The location is great and you can easily walk everywhere and also the Bus- and Train-station is close. The bathrooms could be cleaner and it smelled also bad in there. In the kitchen wasn't that many paraphernalia to cook. THe location is good 15-20mins to bus station and old town. The kitchen is big and staff is helpful. However, the bathroom was not really clear. And the wifi will be a bit slow during peak hrs. My stay was after all ok. Did not expect much after reading some reviews beforehand. Yet, the bathrooms weren't really clean, facilities a little bit rundown. There was a strong urine smell almost everywhere upstairs (besides my room! ), staff was reserved but (sooner or later) willing to help out. For a short stay still ok if you are someone who only stays at the hostel for sleeping. From what I understood it is one of the cheapest hostels in town but not really worth the money. The room was kinda okay and clean even though the mattresses were really hard and uncomfortable. The bathroom was dirty and the showers smelled really bad (probably of mould) also the kitchen was a mess. Staff weren’t much helpful with information, and couldn’t give much direction in English(not even where were the room). I found very difficult to understand (there was a guy over night nice) but everybody else not helpful at all! The comum area is so dirty that no one wanted to stay there! The whole inviroment was very poor! Didn’t feel safe at all! I’ve stayed in many hostel, this one was one of the worse!